Hello lovelies! I was so excited when the Sara of Cupcake Polish reached out to me to review their new collection! 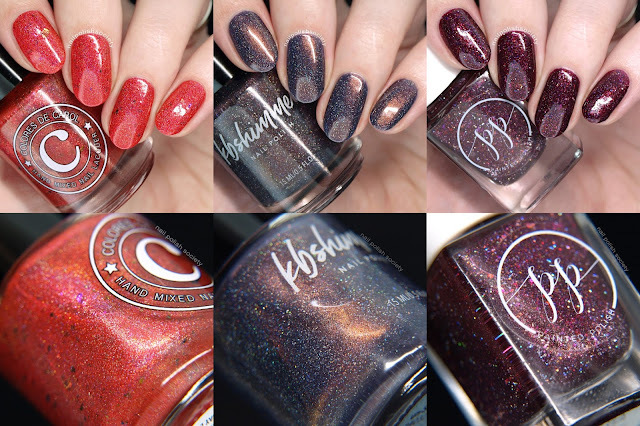 Cupcake Polish consistently makes gorgeous polishes and this collection is no exception. As soon as I saw the theme I knew it had to be good. I love essential oils and each shade does a great job emulating what inspired them. The formulas are super consistent- thin and smooth, and completely opaque in two coats. Cupcake Polish announces its newest collection themed after one of our favorite things- essential oils. Life can be stressful at times and we love essential oils for their aroma and healing properties. The simplicity of these natural oils has inspired us to go back to the basics – or should we say essentials? 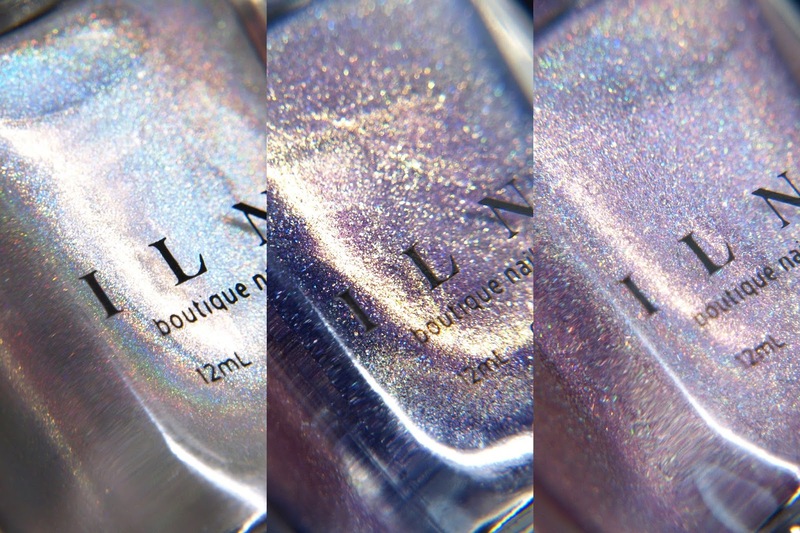 We have created 6 amazing super linear holographic nail polishes that are sure to be staples in your collection. Each polish is carefully handcrafted to resemble some of our favorite essential oils- cinnamon, sandalwood, frankincense, eucalyptus, lavender, and lemongrass. Hello lovelies! I've been looking forward to this week ever since we started the Road to Polish Con! Both shades this week were created in collaboration as "Fairy Cute" polishes and whaaat?.. 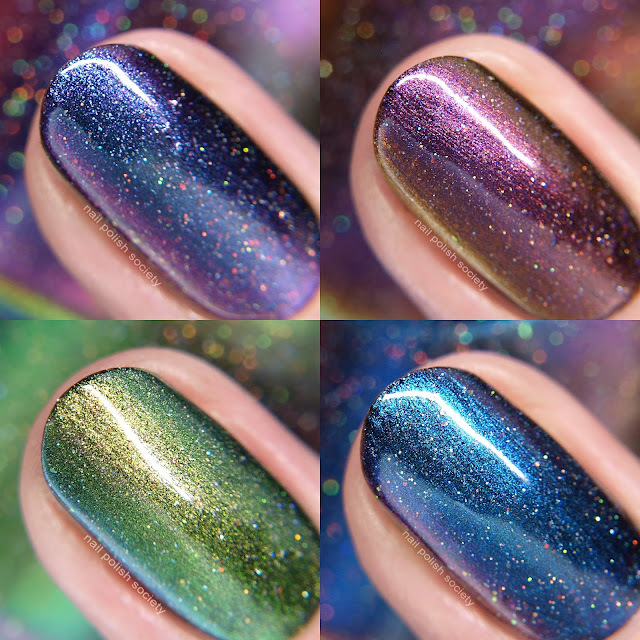 holographic microglitter thermal polishes?! Have I piqued your interest? Now I must apologize because somehow I don't know how to read labels and I didn't find out until today that they are BOTH thermal polishes. So unfortunately I didn't take all the photos needed for the first one. Sad face. "A truly magical pair of polishes that were created for the Midsummer’s Nights Dream theme, specifically to mimic the way light would reflect off of fairy’s wings." Hello lovelies! Today's post is a review of the Essie Gel Couture Enchanted collection which is made up of six shades of varying formulas and finishes. I really love the color palette of all six shades together. Individually they're all quite lovely too although I did have formula issues with one. Let's take a look..
Hello there! I'm here will the newest Colores de Carol release, the Cosmic Summer 2.0 collection. It's made up of four multichrome shades with holo glitter and iridescent chameleon glitter. If these look familiar it's because last year I reviewed the original Cosmic Summer collection (here). The formulas were all great although you might notice a little bumpiness here and there from the glitter. Let's take a look..
Hello lovelies! This month I'm simplifying things a bit and combining all of my Polish Pick Up posts into one. I have three gorgeous polishes to show you that were designed for this May's PPU theme, "90's Pop Culture". It's been fun seeing all the nostalgia inspired shades being created over at the PPU Facebook group. If you want to see what all the participating brands are offering each month and get the chance to vote on themes, you definitely should join in the fun! Hello ladies! 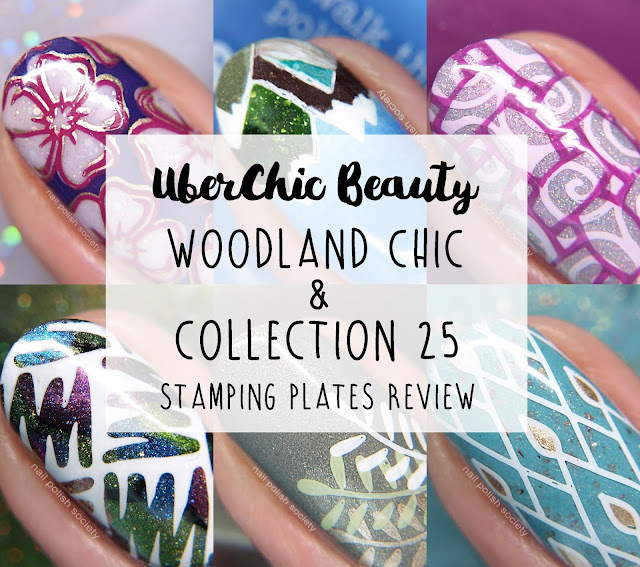 Who is ready for some new stamping plates? I have yet another three plate collection from UberChic Beauty and an adorable Woodland Chic plate that I think you'll love! Let's get to it..
Hello ladies! It's week 6 already in the Road to Polish Con! Today's post will be short and sweet because there's only going to be one polish available next week. No matter, it is a stand out shade all on its own! Hello friends! I was so surprised and pleased to find in my mailbox a package from ILNP containing these gorgeous polishes! It's been a while since I've featured ILNP (I Love Nail Polish) on the blog and I'd say it's about time something was done about it. I've always had good success with this brand and these three shades were no exception. If you're looking for super sparkley holographic polishes with flawless formulas, this is where it's at! Hello peeps! Today's post is going to be quick as I almost forgot about it! I have another Emily de Molly creation, this time it's a limited edition that will only be available through Hella Handmade Creations (previously Hella Holo Customs). If you've never purchased with HHC, I highly recommend joining their Facebook group to keep up-to-date on all the recent changes and each new release. Hello lovelies! 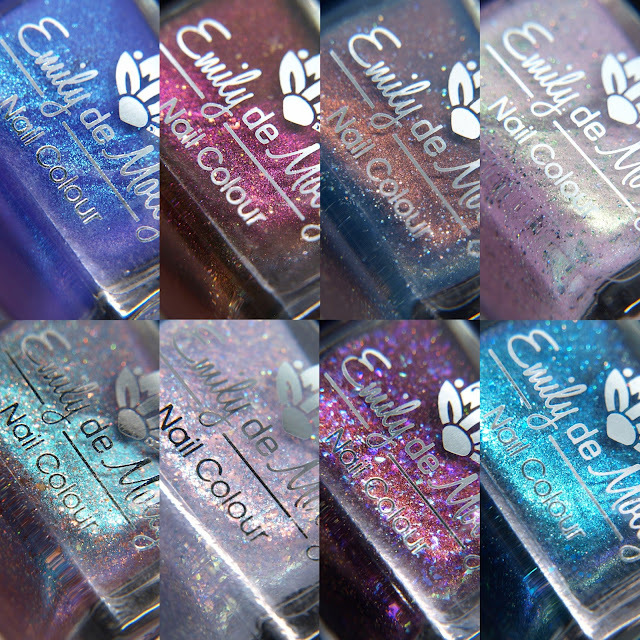 I have eight new shades from Emily de Molly to share with you. Hayley is the master at one of a kind polishes that really go outside the box. There are a lot of must-haves here in my opinion! Let's take a look.. 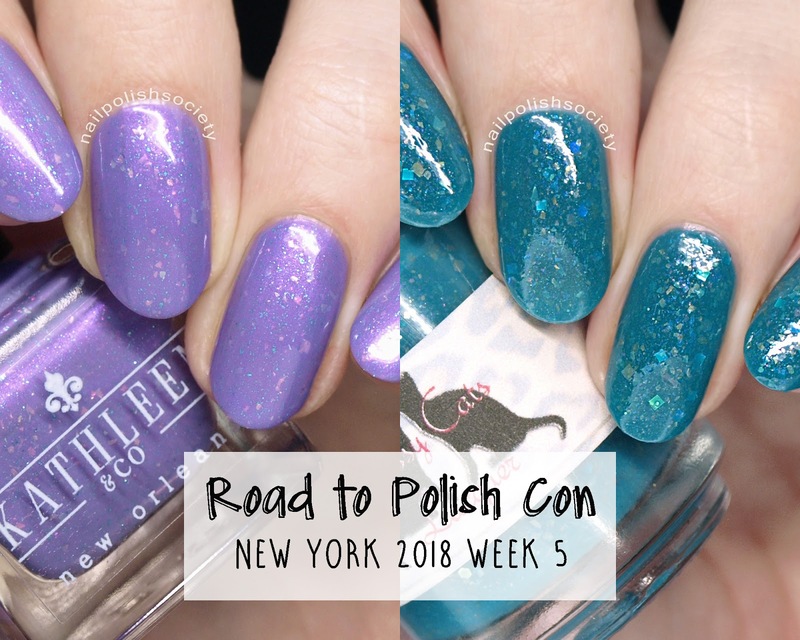 I'm back with more Road to Polish Con shades as the series resumes with Week 5! I have two more new-me-brands that I got the chance to try out. Both have good formulas and their flakey game is on point! Let's take a look..
Hello lovelies! 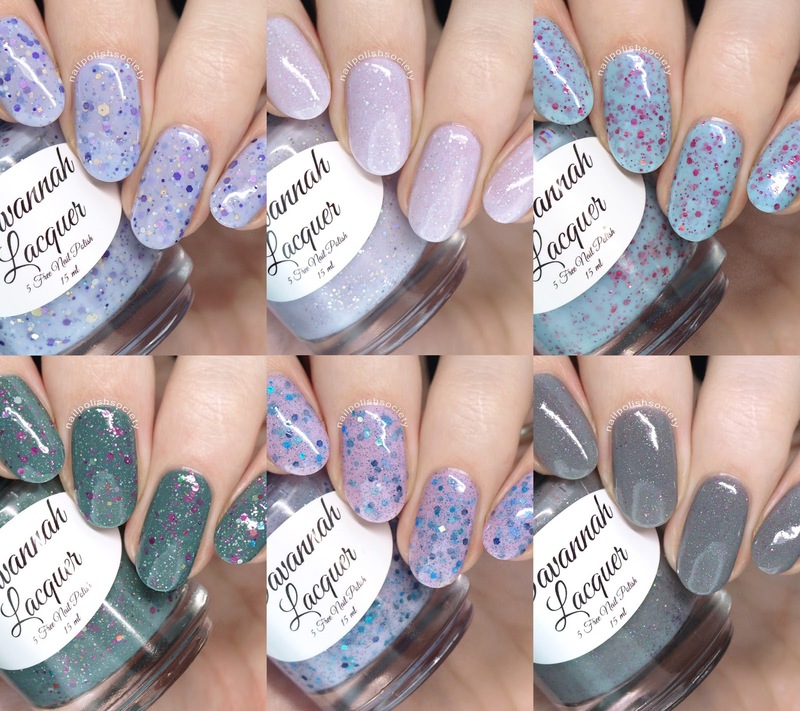 I have the newest collection from Savannah Lacquer called Springtime in Savannah. It consists of six glitter crellies that capture the moodiness and emerging colors of Spring. I was pleasantly surprised by the uniqueness of this collection as a whole, and the inspiration was apparent in each shade. As far as the formulas go, they are all on the thin side so the glitters spread pretty effortlessly. Let's take a look..
Hello friends! I am so pleased to share the Essie Spring 2018 collection with you! The collection has a nautical theme and I think the color palette reflects that for the most part. I have a real soft spot for anything nautical so my heart was already in it before I even tried them on. The best part is that the formulas were all fantasic- really smooth, with nice opacity, and I didn't have any issues with application. Let's get right to it..
Hello lovelies! I have some nail art I created with new plates and water decals from What's Up Nails. 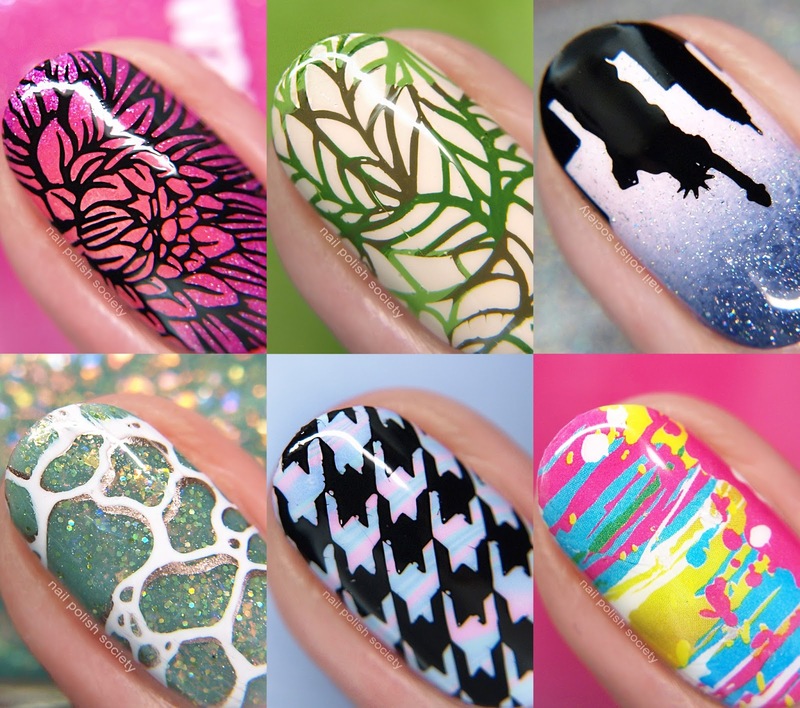 I am really happy with what I came up with and I think you'll like these manis as well. Let's get right to it..
Hello lovelies! I had been patiently anticipating piCture pOlish's new Spring releases and was blown away last month by how gorgeous each one was! I knew I had to buy them all! Fortunately one of them (Embrace) is a re-release that I already owned so it saved me a few pennies. Along with my swatches I've included some comparisons that I hope you find helpful. Let's take a look.. The Polish Convention Returns To New York! After a successful Fall show in Chicago, The Polish Convention is returning this spring to New York. This bi-annual event hosted by Ever After Polish takes place June 16, 2018 at Crowne Plaza Hotel in White Plains, NY. 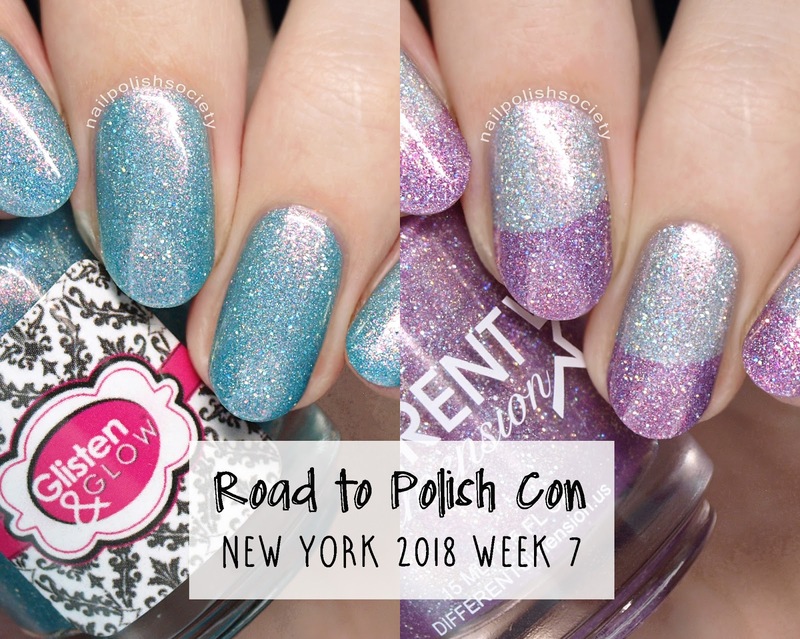 Polish Con will be filled with over 20 vendors helping attendees celebrate their love for nail polish, and nail polish accessories through shopping, live demos, tutorial tables, and meet and greets with their favorite brand owners and creators! Hello friends! I warned you yesterday that this week's post would leave you poor and destitute. But in the end it will all be worth it because you'll have the most gorgeous nails! The Desert Bloom collection consists of nine desert-inspired shades, including six shimmers with subtle holo, and three neutral speckled cremes. Honestly Cirque Colors did such a fantastic job with this collection! They had me drooling with each shade. No surprise either that the formulas are flawless. You'll just want to give the shimmers a little more drying time between each coat. Let's take a look..
Hi friends! I apologize in advance in case you all go broke after this week's posts. I have some seriously awesome collections and products to share! Now that you've been warned.. Today I have the new Painted Polish collection - ‘i love blush.’ The collection features 5 different polishes within the blush color family - each with a different finish! If you're looking for something feminine, work appropriate (without being boring! ), or just light neutral shades for Spring, you're going to love these!